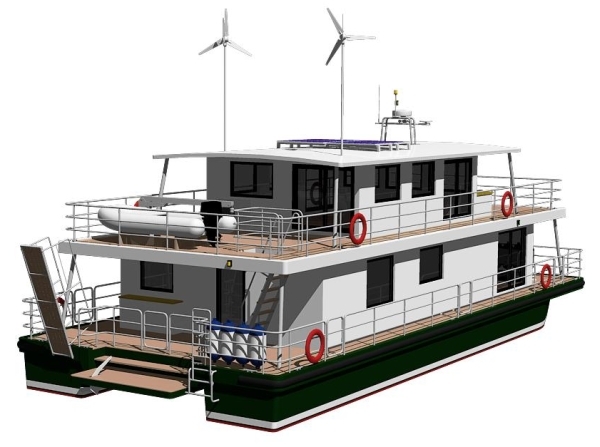 With regards to Recreational Craft Directive 94/25/EC the houseboat design category is C Inshore, which means that houseboat has designed for voyages in coastal waters, large bays, estuaries, lakes and rivers where conditions up to, and including, wind force 6 and significant wave heights up to, and including, 2m may be experienced. 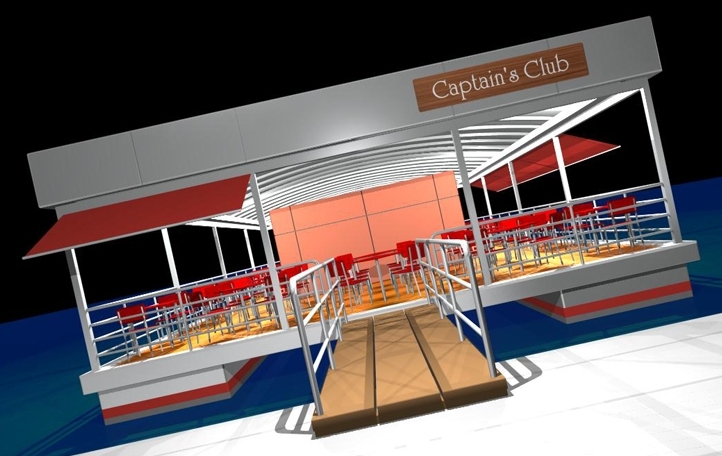 I think this a great liveaboard design. I would like to know more. Ready to answer your questions ). This is by far the best houseboat design I’ve ever seen. Very nice mate. 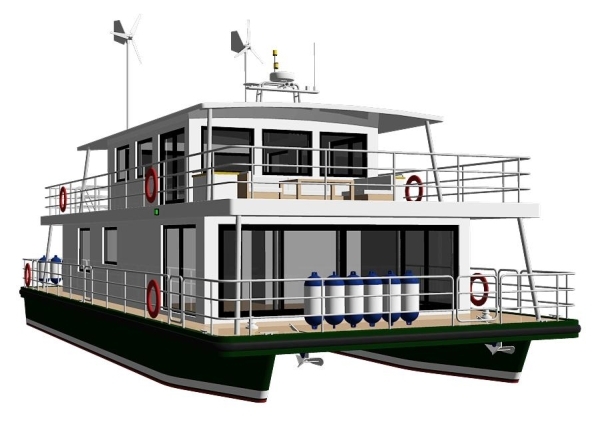 and I really like both of your houseboat designs , they both look clean and modern ..
could you pleause tell me which one would be the cheapest to build and run ? and also the cost of the plans .. I am also in the process of planning a house boat to put in Kilifi Lagoon on the Kenyan coast. Please advise as to how i get plans for your boats? first, you tell us your requirements to see if plans need some modification and we discuss these via emails, Skype etc. Then I send you a simple letter of agreement. If there are modifications, we do them. If there are no modifications we send you drawings, images, AutoCAD files, all documentation we have prepared for the design. Please have a look here: https://modusmaris.com/plans-pricing/. Kindly check email and I also replied to your previous comment. 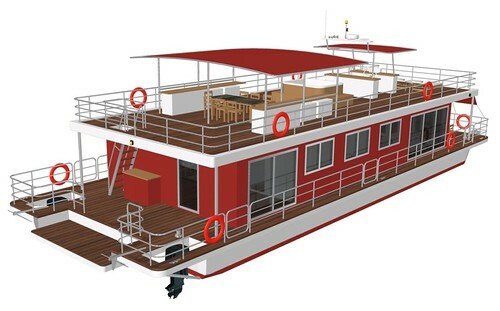 Hi.This house boat looks great,I can only imagine with this type of design there is quite a bit of innovation in the construction or building design.I am searching the web for a design that has to allow me the following.I will have to be able to construct this at the Lakeside.This is for Lake Caborra Bassa on the Zambezi river in Mozambique.This lake can get quite rough as it is about 300km long and up to 50km wide. I need a spacious free moving boat with a outside living deck upstairs to enjoy our special weather. The weight of this boat is obviously a huge factor on running costs and I need to know what should be used to power it.Speed is not neccassary as it is for lessure cruizing . Thanks for your comments. Are you planning boat construction of steel or aluminium? with inboard or outboard engine? how many cabins you need and etc? 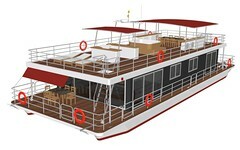 There are variants for Modus Maris houseboat and for Respect River. What sizes are you thinking about? Our email – one@modusmaris.com just in case you would like to contract our service. Do you have an ebrochure or pricing? Hi, I want to receiver more information about your plans. If have you other kind of construction or only houseboat? If have you motor houseboats plans or similar?